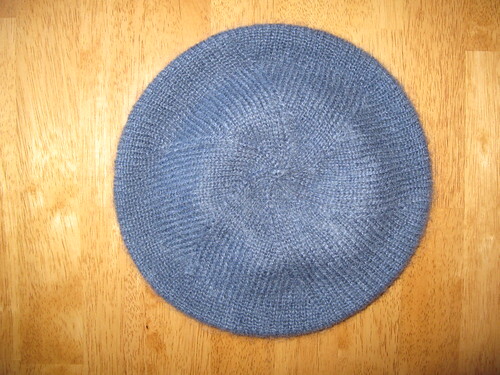 This is the same Sublime Kid Mohair yarn that I used for a previous tam. She liked how lightweight it was (the yarn is sold in 25 gram balls) so I wanted to make another to add to her growing army of tams. I will give this to her the day before Mother's Day because on that Sunday I will be leaving for a trip- Work is sending me to Alaska for a week, then South Korea for a week. I haven't been talking about this trip much because I'm nervous. Actually, "nervous" is an extremely gentle way of phrasing my current state. I'll be okay after I see my doctor this Friday to ask for tranquilizers. 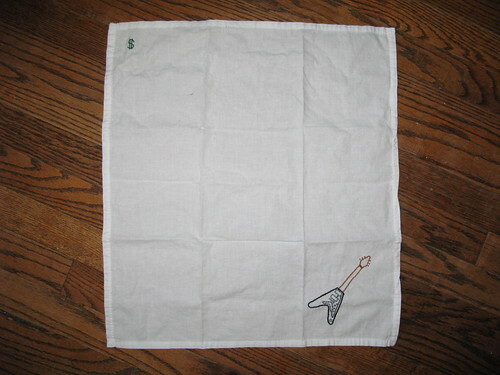 I'm charting some game-themed motifs for small bags. A meeple from the Carcassonne game and a hot air balloon from Balloon Cup. I'll take pictures soon but everything is either in the pencil-to-graph-paper stage or the knit-this-looks-wrong-riiiip stage. Speaking of games, I played Dark Tower for the second time this past weekend. While this 1981 electronic game was kitschy/vintage fun the first time around, this time it was just tedious. I told my sister, "Maybe this is the point of the game: hours and hours of non-winnable entertainment." If you would like to play online, there is a one-player flash version here. LOST is back! Agh! This last episode was awesome after such a long hiatus. It had me yelling, "Bring the thunder!" at one of the characters. And you know what? He did. I've been making scones and corn muffins on the weekends. It's easier for me to leave things like that out in the kitchen and then Dollar and I can just graze throughout the day whenever we want a bite. The easiest (but more expensive) way I do this is with mixes from King Arthur Flour. If you live in the area, you can get some of them at Shaw's or any of them at The Baker's Store in Norwich. I got this Stitch-It Kit ages ago but never delved into the world of embroidery because I was too preoccupied with knitting. Now that the weather is getting warmer, the thought of knitting with wool or having a heavy sweater in my lap makes me want to run the other way. So what's a girl to do? 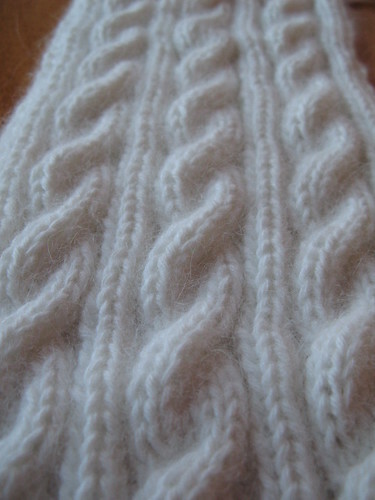 Knit with cotton, of course. 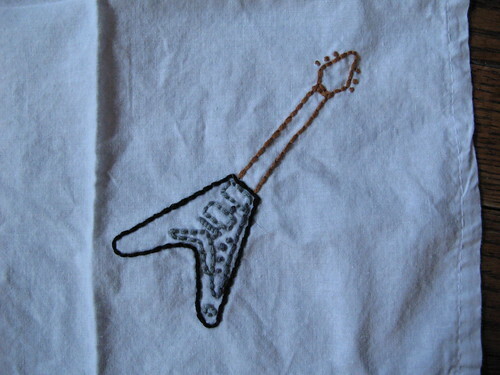 AND maybe try embroidery. I highly, highly, highly recommend this kit. It does have everything you need to start- instructions, tea towels, embroidery floss, a needle, a hoop and iron-on transfers. I was just going to do the guitars but Dollar suggested putting his name in a corner. 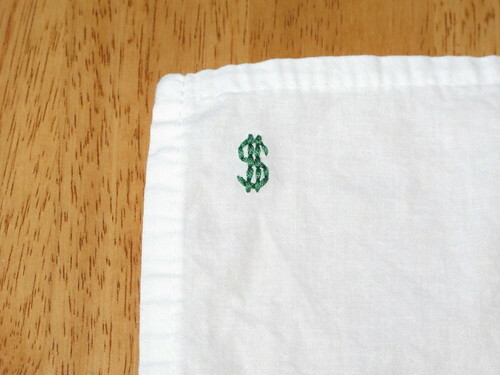 Or, better yet, his super-hero emblem- the Dollar sign! So far, the easiest stitch for me is the back stitch- but it uses twice as much floss. The split stitch didn't work out too well (see the black area of the X-Plorer) but I think it might work better with a different floss. 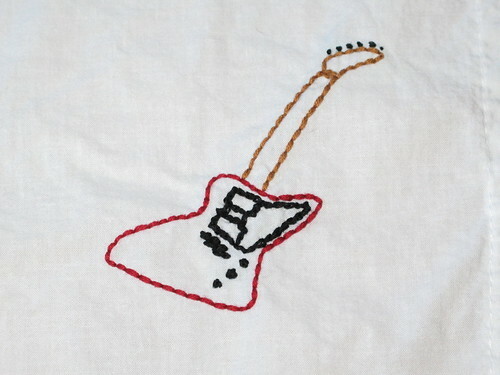 I've tried the French knot (I am having trouble with it) and the stem stitch. Ugh, I want to cast on for everything and quit my job. 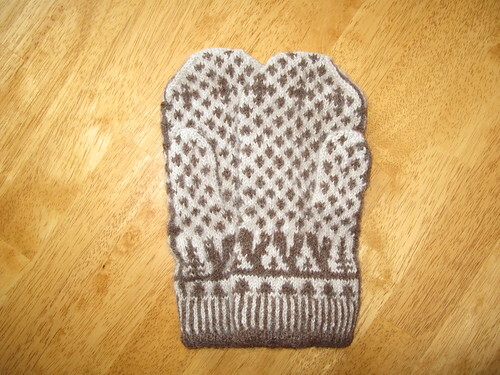 My knitting group is meeting tonight and I'll bring a couple different things- Dollar's yoke pattern jacket (still sewing it) and my mom's mohair tam. 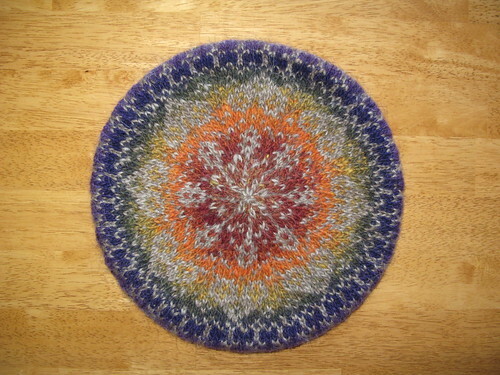 And the Noro tam to show off. 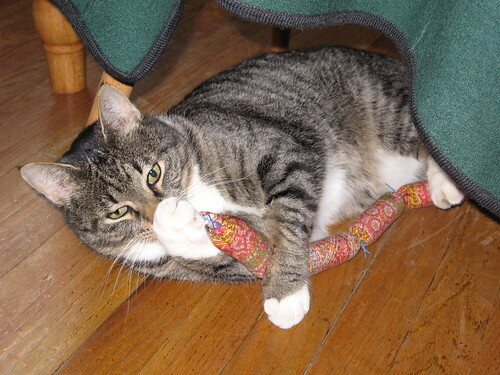 Here he is whispering evil secrets to his catnip sausage. This catnip filled sausage is called Hot Cats, which makes me think of the Hot Cops from Arrested Development. 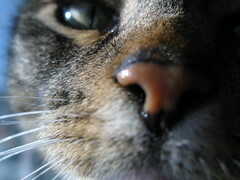 I bought this one at Lebanon Pet & Aquarium. The pattern couldn't be easier. 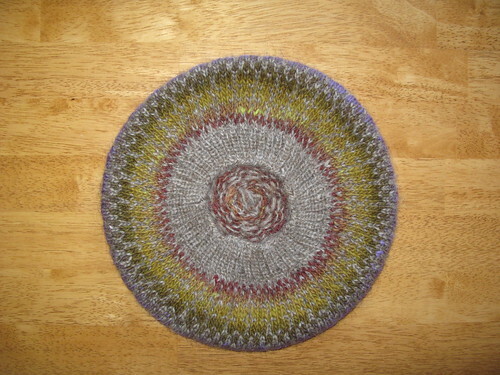 I used one ball of Lopi Lite in a heathery gray and one ball of Noro. I love that there are SO MANY colors in Kureyon. 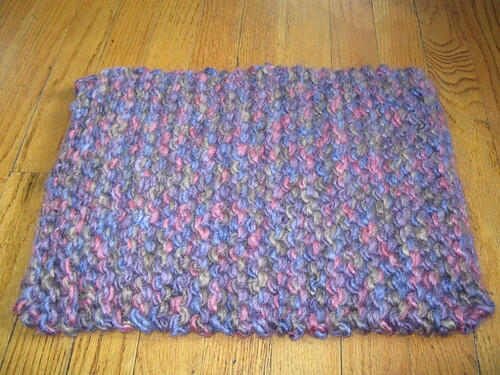 Only two balls of yarn to make this. So awesome. 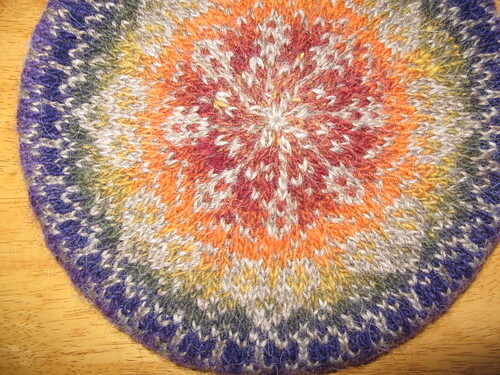 I want to make 6 more of these (I can't wait to see how other Noro colors will look!) 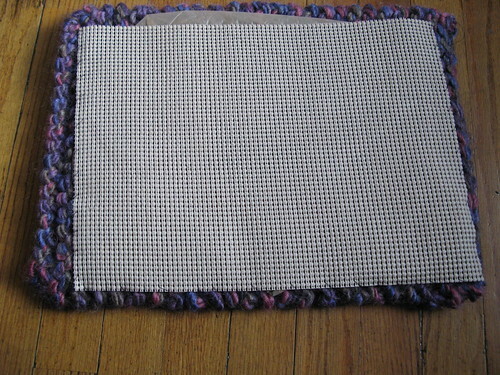 but I'm going to save this project for when I'm bummed out or tired of knitting. This project was easy, fun, fast and... happy! I washed them by hand and let them dry flat for a day. 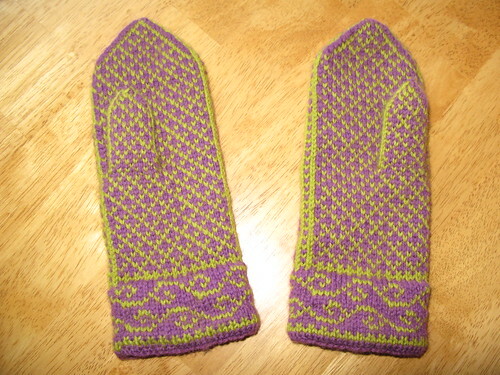 When they were still damp, I threw them into the dryer (in a delicates bag) on a low heat for a while. I forgot about them and they ended up bunched in the dryer for another day. So they look a little lumpy/bumpy. 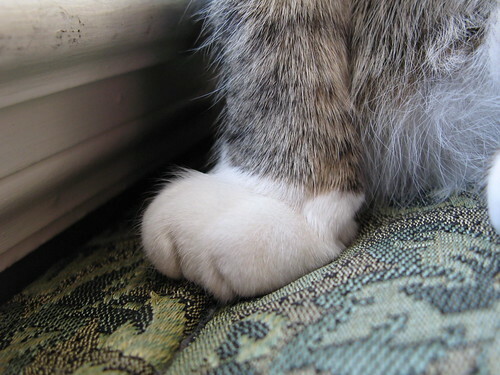 I loves these mitten so much. 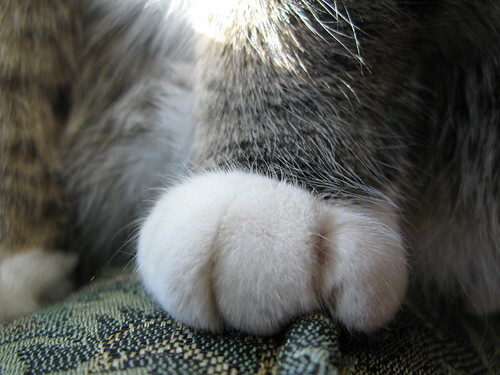 They are so soft I want to wear them all the time. This project was good and bad. 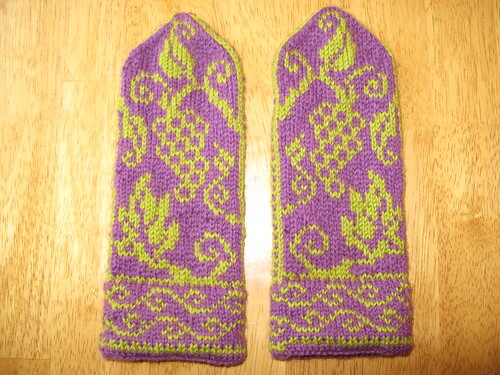 I love the pattern and colors but they are a little too tight and short (my fault for moving the thumb up a few rows to ensure the vines would sit at my wrist). I still have as yet to wash/block, so that will hopefully sort the few remaining issues out. 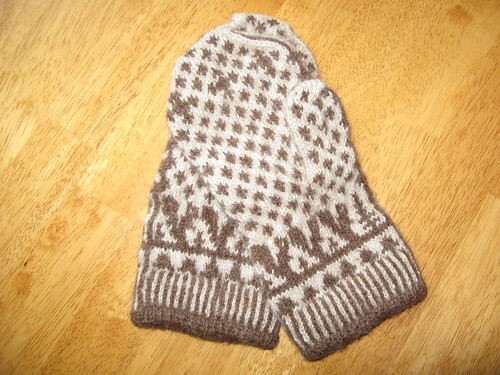 If I could go back and do these again with the same yarn, I'd use US 4 needles, rather than US 2. 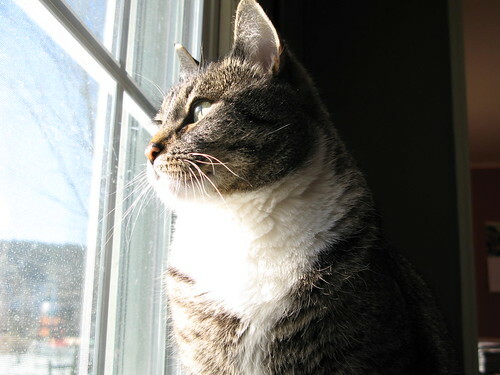 I'm happy that spring is finally unfolding and while I hate to bring up anything having to do with winter... 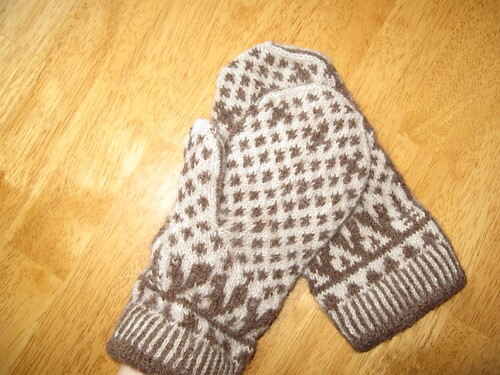 It will be nice to wear these as I'm scraping ice or brushing snow off my car. 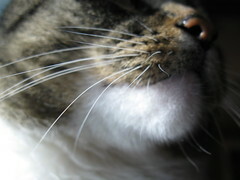 I bought several hanks of Elizabeth Lavold Angora on discount at Webs a long time ago. As I was winding them into balls, I encountered at least one knot in each hank that had to be cut out. I understand a knot here or there occasionally happens but a knot in every one of my hanks? The yarn sat around. I didn't really know what to do with it. Then I thought: What about the Irish Hiking Scarf? 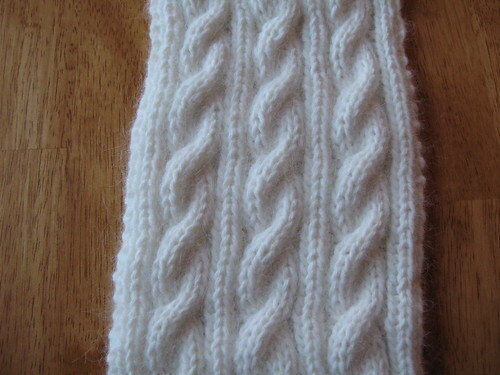 The cables will show with great relief when knit with this white yarn. And angora wrapped around my neck? It will be heaven. Here's the thing: I am terrified of getting any kind of mark or spot on the project and will only work on it after washing my hands a dozen times. I'm worried that I have food on my clothes that will rub off onto the pristine white. I'm not slovenly, okay? Just... Uptight. 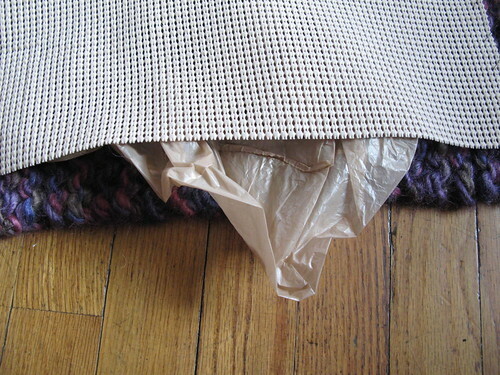 When I'm not working on the scarf, it's hermetically sealed in a plastic bag along with the rest of the unused yarn. If I'm such a psycho about getting the scarf dirty before it's even complete, when will I ever wear it? And how bad will I freak out when it inevitably gets a chocolate smear? Let's worry about that when it (never, I hope) happens. Because there are so many small balls of yarn to knit, I decided to wet splice the yarn ends since the technique worked so well for me on the Boku Striped Scarf. I snipped a short length of yarn, unplied the ends, snipped away half from each end, wet them with water, twisted them around each other and rubbed them together like I was trying to make fire. I let the final result dry and tried to pull it apart. It was fused. Yay- a positive splice test confirmed! Until I actually started knitting and got to the next ball of yarn I wanted to use. I started to splice and realized it had five plies. But... the one I was working with had six plies. UGH! 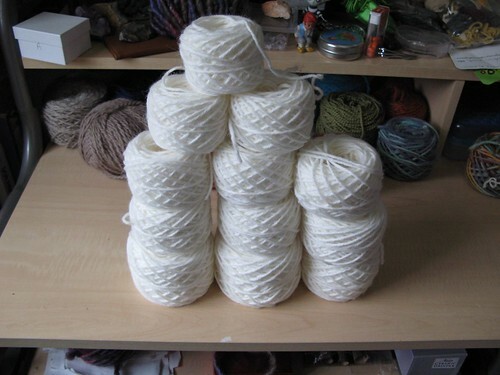 I started rifling through the yarn and sure enough- some balls have five plies and some have six plies. See the thick-and-thinner of it for yourself. 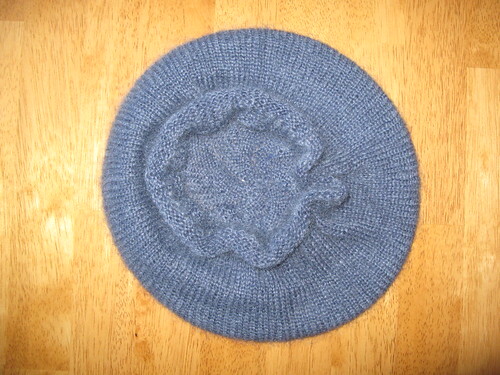 The bottom was knit with six plies, the top with five. See how it's narrower? When I hold the scarf up to the light, the six-plied section is fuller and bouncier than the five-plied section, which is holier. Hole-ier. The stitches are more open. Seriously, though. I'm trying to justify in my head how this could happen. Like, maybe it's common. At the mill, one of the ply cones ran out and they didn't notice. But then, if yarn is sold by weight and many hanks are completely missing a ply... Would they notice the weight difference? Would there be a significant weight difference? Am I getting more yardage with the lighter version? 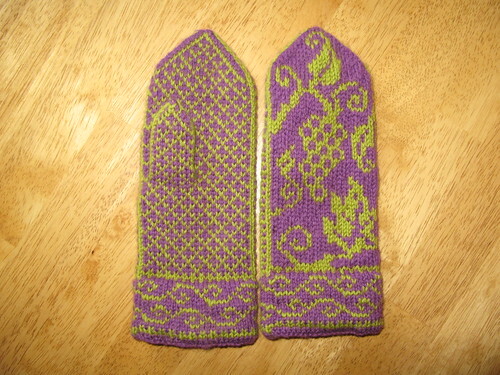 I've completed one thumb and hope to finish the second tonight or tomorrow. 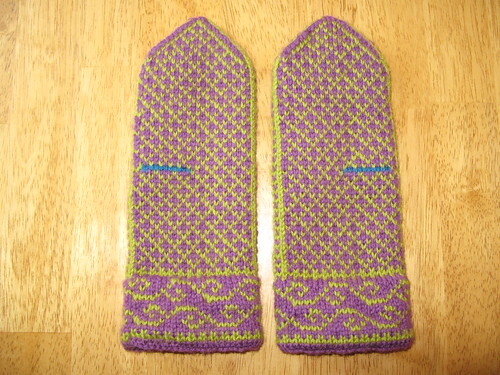 I want to bring the pair to the Upper Valley Knitting Guild meeting on Wednesday. I wanted to bring a finished Yoke Pattern Jacket but there's no way. I spent too many hours this weekend sewing up the sides. I tried doing it in a half-assed quick way (because as much as I love the final result of the mattress stitch, it's such a pain) and it looked all kinds of wrong. So I pulled out the yarn and started again in the correct way. I sewed both sides and started one sleeve but it's so freaking tedious I had to stop. 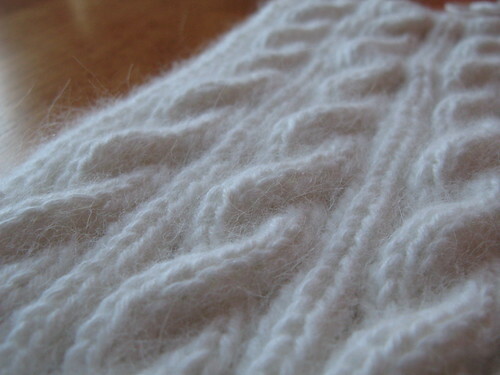 I started a couple new projects: a light-weight tam for my mom and an Irish Hiking Scarf in white angora. 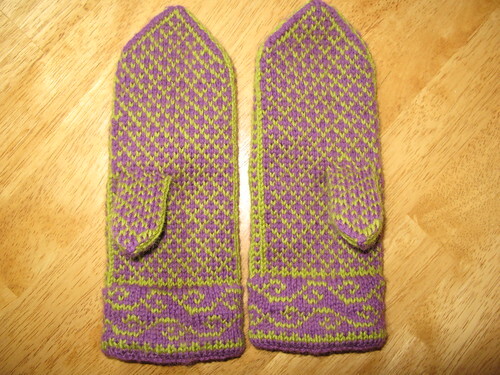 I also want to cast on for a new pair of mittens using the magic loop method. Lest you think I was drunk when I sewed it, the liner itself had a noticeable bias which made it impossible to match corners and still have the liner lay flat. I leave it in a chair he likes and he mostly just sleeps on it.